As an oyster-inspired road trip enthusiast, Virginia had been on my radar quite some time. So when we got a window of opportunity to travel somewhere during the week of 4th of July, the Eastern Shore and Virginia Beach sounded like the perfect getaway. The drive from NYC down to Virginia Beach wasn't that bad. Granted, I wasn't the one driving (♥ my husband). We were on the road for about seven hours, which included a couple bouts of accident-related traffic. We listened to ESPN radio (B is a huge fan of Tony Kornheiser, Mike & Mike, SVP & Russillo) for the majority of the trip—something that I can tolerate if I play Candy Crush simultaneously. The coolest segment of the trek was definitely crossing the expansive 23-mile-long Chesapeake Bay Bridge-Tunnel. It's difficult to describe the sheer size of this modern marvel. From where we were sitting, it looked like this highway above the ocean would never end. After arriving on the other side, we were just mere minutes away from our final destination. Instead of booking a touristy hotel in Virginia Beach, we opted to stay at Ocean Park Cottage, a charming and spacious one-bedroom vacation rental owned and managed by Tim and Chris Solanic. Best decision ever! OPC is located on the edge of a quiet residential neighborhood that's just across the street from the beach. The property comes with a lush and serene garden, an expansive patio, and super snazzy outdoor shower to help hose down sandy beach-goers. The cottage contains a well-equipped kitchen with ample counter space, an open living/dining area, and a sun-drenched bedroom and bathroom. Although we didn't get much time to chat with Tim and Chris during our stay, they were very welcoming and friendly. Hopefully we'll get to see them again! The next morning, I met up with oyster farmer/owner Chris Ludford and his crew at the Lynnhaven Municipal Marina for a chance to observe how they do things at Pleasure House Oyster Farm. There are many oyster farms in Virginia and they range in all different sizes. Pleasure House Oyster Farm is positioned on the boutique-end of the spectrum. Originally, I thought that Chris created the Ludford Brothers Oyster Company for him and his sibling, but as it turns out, the "brothers" actually refer to his three young sons. Although he hasn't put them to work (yet), his volunteer-based team is comprised of family and friends. This includes his lovely mother, Beverly (aka "Mamaw") Ludford, OPC host & social media extraordinaire Tim Sonalic, and super helper Lee Gregory. Together they tackle nearly all of the farm work by hand, from grading to tumbling, making Pleasure House Oysters a truly artisanal offering. "We're always racing against the tide," Chris remarked as he calmly steered his boat around the lengthy tufts of marsh grass and million dollar waterfront homes. As the wishy-washy concealer and revealer of the sea's secrets, the tide waited for no one. At that moment in time, it afforded us a rare glimpse of the river's wild oyster beds, perhaps the first that I have ever seen with my own eyes. After a 15 minute ride to the Western Branch of the Lynnhaven River, the engine quieted and the boat slowed to a slither. Some portions of Lynnhaven River are designated as "No Wake" zones, but the Pleasure House Oyster area was not one of them. Chris took care to minimize his presence in and around the mudflats, but not everyone was as considerate. Several boaters swept by at full speed, creating large ripples that shoved the cordgrass around in a circular motion. "By the end of this summer, this chunk of mudflat will be gone," Chris said as he pointed to the front line. Despite the town's best restoration efforts, which has helped open nearly half of the river back to shellfishing, there's still a ways to go. Our boat docked near a small piece of dry-ish land and the guys began to unload their gear. A makeshift table was quickly constructed using empty oyster cages. Instant workshop! While the guys set themselves up to work, Mamaw Ludford and I stayed on board. As I watched her sort through trays of juvenile oysters, I learned more about their family ties to the water. In some shape or form, The Ludfords have always been on the water. As a kid, Chris had his own minnow (bait) business. Then as a young man, he conducted fishing and boating tours. Today, Chris works at the Virginia Beach Fire Department as a fireboat captain. This is in addition to this other full-time job as an oyster farmer and occasional oyster farm tour guide. Now that's what I call hustling! Juvenile oysters can grow quickly, but they need a lot of TLC. "They like to be handled," Mamaw Ludford asserted as she carefully poured a bucket of baby oysters into her grading tray. All of the oysters that pass through are too small to graduate to the next level of cages. Oysters that are large enough are upgraded into larger bags to allow them more grow-out room. While the sorting goes on, dead oysters are also culled from the lot. Meanwhile, maintaining the grow-out bags is a whole other matter. Growers are in a constant battle against predators and biofouling. Bullnose rays will seize any opportunity to chomp down on some baby oysters (I mean, who wouldn't? ), so all of the bags are locked up in wire cages. Pesky, slimy coatings of alien-like sea squirts (aka "sea grapes") and algae that tag team both sides of the bags can also suffocate the oysters. The only way to keep these sea-nuisances at bay is to clean the bags regularly, which is a lot easier said than done. I bet parents can commiserate with oyster farmers. Their babies can grow up so fast that it's hard to keep up. One day you might have two bins of oysters to work with and the next week, it's multiplied to six or eight. It's not just their size either, it's the weight. Before you think oyster farming is a breeze, just consider this: a few ounces of 2mm oyster seed can net out in thousands of pounds of heavy lifting down the road. For Chris and his crew, it's a backbreaking labor of love. At maturity, Pleasure House Oysters are quite large; they are least 3 inches in length. But the notion of "premium" doesn't just equate to large size. For Chris, it means adding a certain level of customer service and consistency. For example, he and his crew hand select the heartiest and most beautiful Pleasure House Oysters for Terrapin, a highly acclaimed fine dining restaurant in Virginia Beach. Only 10% of the harvest ever makes the cut. They also harvest and deliver same day, year-round. By keeping his distribution local and limited, Pleasure House Oysters has been able to enjoy premium brand status and pricing. What Does it Take For a Pleasure House Oyster to Make it to Terrapin? Chris led me to another spot nearby on his lease where he was experimenting with something else. He waded into the water and stuck his hand into the mud. He pulled out a cluster of oysters that were attached together in a free-for-all party ball. This, he speculated, could be the future. At first, I was a little confused. It felt backwards to me. But then I realized that he had a bigger vision -- one that would allow him and other oystermen to revive the glory days of oystering. Modern aquaculture is good and well and I believe it will continue to exist. But what if we could bring back more wild reefs and responsibly reap the rewards from having a natural abundance? How could the industry then evolve and learn from its mistakes? Would that be a way to help differentiate the "well oysters" (a term Chris reserves for low grade oysters you get for cheap -- like well drinks at a bar) from the premiums? Instead of reverting back to nameless commodities, would the market accept this new class of "wild oysters" with provenance? To help show proof of concept, Chris took me out to the Eastern Branch of Lynnhaven River to see Mark Sanford's oyster reefs. Mark is a 5th generation waterman who started to rebuild oyster reefs in Lynnhaven about four years ago. He first laid out a base of recycled shell and then allowed a mix of wild and replanted spat-on shell to set and growth. By year two, the oysters in his reef had matured and were thriving. I put on a pair of water shoes and hopped into the knee-deep water. Just so you know, it's probably not wise to walk into anyone's private property without permission -- especially if it's an oyster reef! That's just asking for it. Fortunately, Chris got the green light from Mark ahead of time to show me around. The water was cool, but not too cold. The river bottom was a bit soft, but still manageable to trek across. We approached the reef slowly with care. Chris lifted a couple out of the water for a closer look. I was surprised to find so many mega oysters. I guess when you just let them do their own thing, the sky's the limit! Knowing my new-found fascination with water salinity metrics, Chris stuck a salinity meter probe into the water next to the boat and took a reading. It landed at around 25-26 ppt. As a point of reference, average ocean salinity is 35 ppt. Pleasure House Oysters possess a nice balance of brininess, vegetal notes and subtle sweetness. They're an approachable, meaty oyster with a clean, light finish on the palate. The dense, chewy and velvety texture is what I love the most about them. Chris shucked several "Terrapin-worthy" PHO's for me. I slurped them down gleefully, enjoying the next one more than the last. I tried a large 4.5-5 inch oyster, but the meat was slightly too cold from being on the ice too long. I also tried one straight from the water, which had an incredible punch of merroir. For me, this is what oyster appreciation is all about. As the tide rolled back in, the crew decided to call it a day. Before returning to the dock, Chris had an errand to run. We rendezvoused with another boat on the water and Chris purchased several dozen great-looking blue crabs from waterman/professional crabber Dirk Sanford (Mark Sanford's brother). I think that given the shortage this year, we were truly lucky to have gotten this opportunity. During the exchange, I learned that the males were referred to as "Jimmy's," and the females as "Sooks." How do you tell the difference? One way is to look at the underbelly. The males have a narrow, pointed flap and the females have a much wider, rounder one. But for whatever reason you are unable to turn them over, Chris had another clever way of distinguishing the two. "The females have nail polish on." He was referring to the bright red and orange pincher tips! Later that evening, Chris and his wife Jen came over to Ocean Park Cottage with a large crab pot, outdoor burner, and propane tank. He proceeded to pour a concoction of vinegar, beer and water together as the base. Next, he threw in a generous cup of J.O. Spice Co spices (a nice change of pace from the usual Old Bay). Finally, the crabs were placed neatly into the pot and the lid was closed. Meanwhile, I tried to avoid the mosquitos and "no-see-ums" with little success. The numerous bug bites on my legs have still been on-and-off itchy lately, two weeks later. I proposed eating the crabs inside where it was air-conditioned and bug-free. Everyone seemed relieved to hear my proposal. 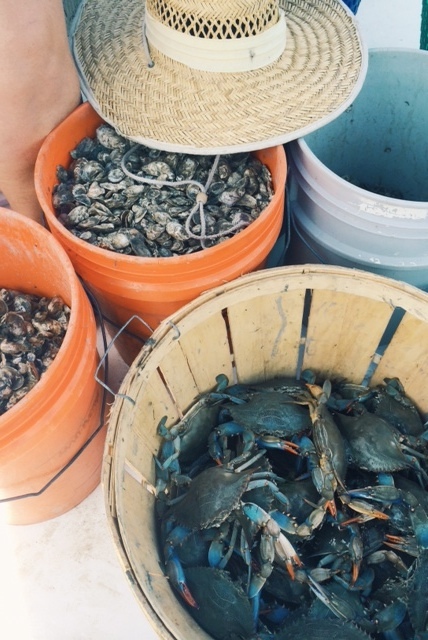 Chris and Jen taught us how to eat blue crab like locals. Despite learning all of the techniques and tricks, B and I were still painfully slow at pulling out the meat. The effort was well worth it though. The crabs were soooooooooo tasty. WOW. The meat was so tender and well-seasoned! The males and females definitely tasted different and I liked both variations. I couldn't stop... and fortunately for us, there were plenty to be had. We've done a few crab boils in Manhattan before, and frankly, they don't come anywhere close to how good this was. (A humble reminder telling us that NYC doesn't have it all.) Getting to enjoy the crab feast with great people and some icy cold 90 Minute IPA's and crisp champagne made this the perfect night in. The next day, I devoured another heap of cold leftover crab as a snack. I think having them cold might actually be just as good, if not better than having them warm! The final highlight of our Lynnhaven adventure was going out on a half day fishing trip with Chris, competitive fishing champ and captain Aubrey Williams of Look-N-Hook Charters and his mate Quentin Munson. After Chris learned of Bryan's passion for fishing, he couldn't have been more gracious about taking us along on his trip. We were blessed with great weather: clear skies and just a little bit of wind, which made for great Cobia conditions. To play it safe, however, I decided to pop a couple Dramamines. I got fairly sleepy, but that didn't stop me from waking up when the action started. Bryan ended up reeling in two sizable Cobia. The second was a nice keeper, which Chris later filleted for us to have for lunch at Dockside's. Dockside Restaurant & Seafood Market is a great place to grab a good meal, fresh seafood to go, and adult beverages. They'll cook up your catch for a small surcharge. Looking back at our last few days, we really couldn't have done any of it without the help, generosity, and hospitality of Chris Ludford, Tim Solanic, and their wonderful families. Thank you so much for showing us such an awesome time!! !